your car stereo. you can manually set the station from the interface, or use the android system from your device. Pair up the phone with the adapter and start the music or wire the Audio outputs (Rca) to any radio with an Aux input or Auxiliary input adapter then press the "Aux, Cd, or Sat button on the radio. To browse and select tracks, or use Internet radio stations like Pandora livio radio or any internet radio the operator simply uses the phone standard buttons or touch screen controls. on/off or change Fm Frequency. 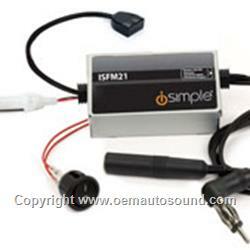 » Compatible with any Factory or Aftermarket FM Radio or radios with Aux inputs. » No visible wires in the vehicle. » Auto- reconnect when turning on the ignition. » Interrupts incoming antenna signal when in use for best sound performance. 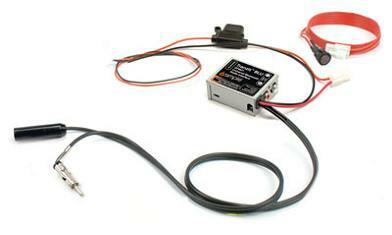 The TranzIt Blu (ISFM21) Bluetooth communication to enable wireless audio streaming for virtually any vehicle and any Android smartphone, .This android interface adds an interference blocking system that disengages the incoming antenna signal when audio playback is detected.The Bluetooth uses the A2DP profile, and the Android app control the system.